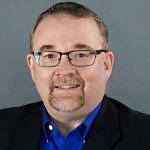 Dr. M. Shane Wood is an experienced evaluation team chair and evaluation team trainer for ABHE, and has served at three ABHE institutions over the past 15 years. Dr. Wood has a Ph.D. in Organizational Leadership (Regent University), M.Div. in New Testament (Lincoln Christian University), and a B.Th. in New Testament (Ozark Christian College). He has served as Program Director for the M.A. in Organizational Leadership and Dean of the Hargrove School of Adult and Graduate Studies at Lincoln Christian University, Chair of the Christian Ministries Division at Florida Christian College, and Chief Academic Officer at Nebraska Christian College. His teaching experience includes undergraduate, master’s, and doctoral courses in organizational leadership and Christian ministry, and dissertation committee chair for the Ph.D. program in Organizational Leadership at Johnson University. Dr. Wood has a background in pastoral ministry, and has also served in an interim capacity as a college chief financial officer.ABHE’s Commission on Accreditation.